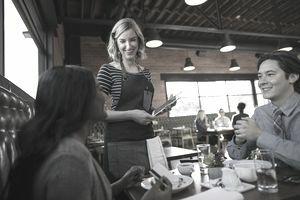 Employers in service industries have a unique pay and tax situation that involves tipping income for employees. The person doing the tipping and the person getting tipped are both in the transaction, but if you own a business in which employees are tipped, you need to know how to handle the taxes and payment on those tips. If a restaurant adds a gratuity amount to a meal price (for large parties, for example), that's not a tip. The term "tipped employee" is used to designate employees whose income regularly and customarily includes tips of at least $30 a month. This term is used to differentiate between employees who are tipped and those who are not. Like all other income, all tips are subject to Federal income taxes and all tips totaling $20 or more in a month are subject to FICA tax (social security and Medicare taxes). While the employee receives the tips, you must receive information about those tips so you can include them on the employee's W-2 form. It should be stated that tips are the property of the employee and you (the employer) can't take tip income from them, nor can you reduce their income to offset their tip income. How tip income is included in service employee income is explained below. What Are the Ways Employees Get Tipped? Workers often receive cash tips, such as extra cash in a payment to a taxi driver ("keep the change") or an amount left on a restaurant table. More commonly these days, a tip is included on a debit or credit card transaction, such as at a restaurant. Tips may be split or pooled by various employees. For example, you may have seen a tip jar at a car wash. The tips are divided among employees. If you have such a situation in your business, you probably have a policy about how these tips are split. Service charges may also be considered to be pooled tips. The IRS also mentions non-cash tips such as tickets or other items that have a value. How Do I Know What Tips an Employee Received? Employees are required to keep a daily tip record and report these tips to you ($20 or over a month) on a regular basis. The IRS would like to see employees report tip income on a daily basis. Of course, the employee must report tip income on their individual tax return. In addition to reporting tips included on their annual W-2 form, they must also report tips for Social Security and Medicare tax calculation purposes (using IRS Form 4137). How Are Tips Collected and Reported? The employee keeps all of his or her tips. If you are collecting tips on a credit or debit card, you must reimburse the employee for those amounts. Pooled tips are common in some restaurants and other services, like the car wash mentioned above. The employees divide the pooled amount according to their own arrangements and each individual reports their portion of the pooled amount to you. States have different tip pooling laws and arrangements. The required service charge imposed by some restaurants for various reasons is not a tip to the employees. Service charges are considered to be income to the employer unless they are distributed to employees. To clarify, the IRS says, "Regardless of whether the service charges are distributed to employees, these amounts are gross income to the employer." This employer reminder from the IRS explains more about the difference between service charges and tips. How Are Tips on Cards Credited to Employees? When tips are included in credit or debit cards, you must give the tip amount to the employee. You may reduce the tip by the transaction fee amount charged the credit card company. For example, if the credit card transaction fee is 3 percent, and an employee's tip is $5, you may give the employee $4.85 (the tip less the transaction charge). But the Department of Labor says this reduction can't bring the employee's pay down to less than the minimum wage, and you must reimburse the employee on the next payday (not waiting until you receive the reimbursement from the credit card company). How Does Tip Income Affect an Employee's Total Wages? All employees must be paid at least the minimum wage, including tip income. You (the employer) are not allowed to use employee tips except as a credit against the minimum wage. You can use the tip amount to offset what the Department of Labor calls the "required cash wage," which is currently $2.13. The current federal minimum wage is $7.25. The difference between the required cash wage and the minimum wage is assumed to be made up by tips. If a tipped employee works overtime and is eligible for overtime pay rate, you must make sure the employee receives the entire amount of overtime pay. First, you must pay a tipped employee at least $2.13 an hour before tips are counted. Then the employee tips are reported to you by the employee, as described above. The $2.13 plus the tips reported by the employee should equal at least the minimum wage. If the two amounts don't equal the minimum wage, you as the employer must make up the difference. Some states have a different minimum wage rate for tipped employees; some require that employees be paid the full minimum wage before tips, while other states have a higher minimum required cash wage than the federal amount. If the state minimum wage law requires a higher amount than the federal rate, you must use the state's minimum wage rate amount. How Do I Report and Pay Taxes on Employee Tips? First, you must collect employee tip income reports (from employees, from card transactions, from other sources) and include all tip income on the employee's wage payments for each payroll. You must withhold income taxes and FICA taxes on tip income in your calculation of wage payments. You must also pay your employer share of FICA taxes on tip income. Tip income is also subject to both the maximum Social Security limit and the additional Medicare tax. You must include employee tip income and withholding in all payroll tax reports (Form 941 — the quarterly tax report, and Form 940, — the annual unemployment tax report). And you must make payroll tax deposits as required on tip withholding and FICA taxes. You must keep records of employee tip reports in employee files, in case of an audit. What If the Employee Doesn't Report Tip Income to Me? It's the employee's responsibility to report tip income to you as the employer and to the IRS, for income tax purposes. The IRS says you are not liable for the employer share of FICA taxes "until notice and demand for the taxes is made to the employer by the IRS."